Get yourself a Mission Burrito. Have an Izze soda — my favorite is Sparkling Blueberry. Head to ChaChaCha and drink some Sangria. Put on a gimp suit and head to Castro or Folsom … check out the piers and strippers down on Broadway. 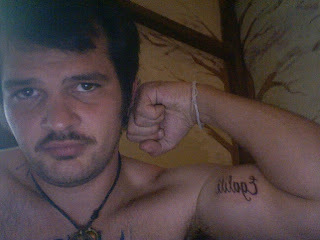 Get a tattoo at Goldfields: I did. Go to to North Beach and punch out an Italian. Then go have some pasta. Head out to Sunset and chill out on the beach, smoke Buddha and talk about the demise of the Federal government. Laugh at Hipsters every chance you get. Truly, these outgrowths of the alternative “we love the Cure” community keep me in stitches. i mean the females of this tribe — and every other tribe actually — are tolerable and even quite attractive at times until they fix you with the “i hate men” glare. But the dudes. jesus. I guess that’s part of living on the west coast. I hear Portland is overrun with these people. Make fun of them without pause. go to Oakland and peep the real life. have some chicken or BBQ somewhere and walk around. Try not to be scared. I love the USA baby. i could never hope to defeat Sammy in a stache vs. stache showdown. I’d have to add accessories and such. its good to be back. rindy: show us yer stache daddy.